Welcome back to the second issue of Out Of Africa! The launch edition was a real success and well received by everyone – thank you! 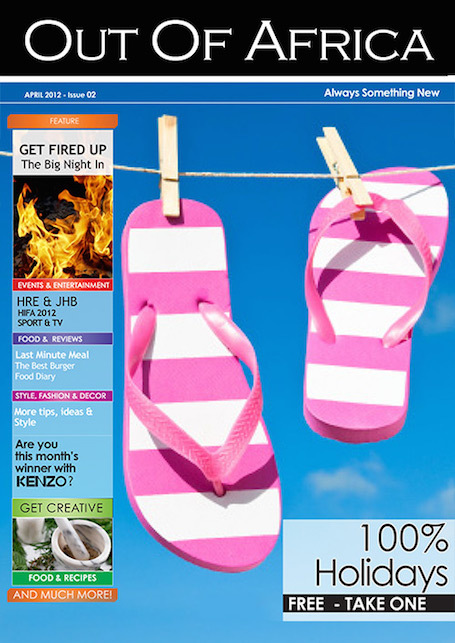 This issue we are 100% Holidays – what to do and ideas of how to keep everyone entertained as there are many public holidays as well as School Holidays in April. This issue is jam packed with ideas. We visit Kariba and give you ideas of where to stay. For food lovers: there is a special feature on The Big Night In: Fired Up – The BBQ. We also have HIFA covered this month – whose is coming and we have hand picked the highlights of HIFA – a must read if you are planning on attending one of the biggest cultural events of the year. As for the shopping, we have that covered too: with over 80 products sourced – from food, to fashion to beauty and so much more. There is definitely something for everyone in this issue. We have a luxury Kenzo competition too – so get entering! Next month, the magazine will go on sale – as a premium A4 Magazine size. It will be bigger and better! Available for $3 at all leading retailers. We would love to hear what you think about the magazine – write to us: sarah@outofafrica.co.zw. The best letters will be published in May. Till Next Month…Enjoy all the holidays coming up, Happy Easter to all.